Financial forecasting provides a roadmap of where a business is today, to where it needs to go. Fiscal Advantage estimates revenues and expenses for three years, including the movement of cash in and out of the business. Users can modify assumptions and explore how operational changes impact the business’s profitability, cash flow, and the company’s ability to borrow funds. Forecasting is the key to better utilizing the business’s resources to get the most out of their products or services. If one doesn’t control their resources, resources will control you. Liquidity problems can inflict hardships on a business, resulting in selling shares or assets for less value or worse, insolvency. Financial forecasting sounds complicated and time consuming, but like most processes, when broken down into parts, it isn’t so complicated. First, one has to decide what you want to forecast. Some businesses will want to forecast the income statement, others will include the balance sheet, and still others will include the cash flow statement. For this reason, we should define forecasting goals. In order to develop a financial forecast, one should determine what it takes for the business to thrive. Any forecast that is short of a plan to prosper, is inadequate. For a business to succeed, certain items need to be included in the forecast. Businesses need to perform four steps to estimate the cash needs of the business. Step one: document the income stream of the business: sales, COGS, operating expenses and EBITDA. Step two: estimate the working capital needs to support sales. Step three: itemize future capital expenditures needed to reinvest in the assets. Step four: document the financing cost. The result is a cash surplus or a cash deficit, which is the cash needs of the business. 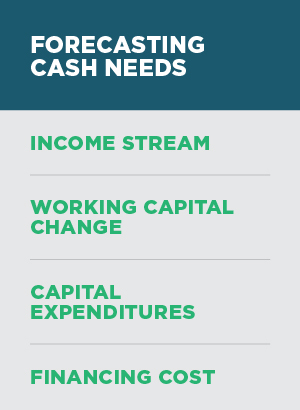 The cash needs have to be covered by debt or an equity infusion. Forecasting is about reviewing the operations of the business to determine what is needed in order to achieve the required cash flows with the given resources. The income stream can be measured many different ways. We don’t want to include non-cash expenses (depreciation or amortization) because we want to look at the cash generation – not the profit contribution. Therefore, EBITDA is a good measurement of the income stream. Begin by projecting sales, COGS if appropriate, and the operating expenses less the non-cash items and interest expenses. This is the forecasted EBITDA. When analyzing current assets, receivables and inventory should be segregated from all other current assets. The same should be done with payables, separating them from all other current liabilities. By isolating receivables, inventory and payables, businesses can later make assumptions in forecasting the ‘days on hand’ which impacts future cash and credit line capacity. Fiscal Advantage calculates the historic year to year working capital changes for the next three years. Capital Expenditures can vary year to year. To smooth out capex spending, Fiscal Advantage blends the depreciation schedule and the actual capital expenditures to form a percentage of sales capex figure that is applied to the forecast. Future financing costs are a very important part of most businesses. If interest or agreed upon dividend payments are not paid or distributed, the business’s access to capital will be non-existent. Most businesses need to borrow capital to finance sales, so financing costs are an important element to have in the forecasting model with coverage ratios. Lenders want to see how they will be repaid. Deducting the working capital changes, capital expenditures and financing cost from the net revenue stream, arrives at whether the business has a cash surplus or a cash need. If the result is a cash need, this has to be financed, an equity infusion is necessary or the business has to make changes to meet is cash requirements. Most businesses have a cash need because they are growing. Growing businesses have to be able to secure financing from lenders. Fiscal Advantage allows users to modify assumptions on the seven cash drivers (sales growth, COGS, operating expenses, AR Days, Inventory Days, Payable Days and Capex) in order to determine which combination of assumptions will present the most accurate estimate and goal of future profitability and cash flow of the business. Forecasting determines the capital requirements of the business and is the first step in budgeting. Most businesses have cash shortages and have to meet two qualifications. One: have the ability to borrow funds and two: have the ability to repay the funds. There is a difference. The ability to borrow is based on collateral advance rates and the ability to repay debt, is based on having an adequate operating cash flow to service the debt. Fiscal Advantage’s forecasted cash flow and loan capacity first defines the cash needs of the business, and secondly, the business’s ability to borrow and repay the loans. Loans are typically categorized as revolver loans and term loans. The revolver loans are draws against the receivables and inventory. Lenders only want to advance funds based on receivables that can be collected, so they will require a receivables aging report. Fiscal Advantage assumes 90% of receivables are current with an advance rate of 80%, the amount the lender will finance. On inventory, Fiscal Advantage assumes all inventory is good with an advance rate of 50%. This might change, depending on the type of inventory. If inventory is customized or largely work-in-process, the advance rates will be less than if the inventory was easily marketable. Fiscal Advantage forecasts future revolver loan capacities three years out. Term loans are long-term loans collateralized by fixed assets. Cash flow loans are based on a business’s cash flow, providing minimal debt service ratios can be met. Debt service coverage ratios (DSCR) are the basis of a business’s ability to repay loans and are normally based on EBIT or EBITDA less capital spending. Fiscal Advantage forecasts the fixed asset needs using a blended depreciation and capital spending value. Normally a 1.25 DSCR or better is required to qualify for loans. Forecasting reliable cash flow with good collateral and a reasonable DSCR makes for success. Businesses need to forecast three years of cash flow which includes: profits, cash management, financing cost and capital spending to determine the cash needs of the business. Cash shortfalls are covered by accessing cash from the balance sheet, new equity or financing, or by making operational improvements. For loans, collateral is reviewed for advance ratios and the DSCR needs to meet minimal ratios of 1.25 or better. It is critical to show the lender how they will be repaid. Fiscal Advantage provides a forecasted cash flow with a loan collateral review and advance rates. Users can override the historical assumptions to better plan their cash flow and begin budgeting.